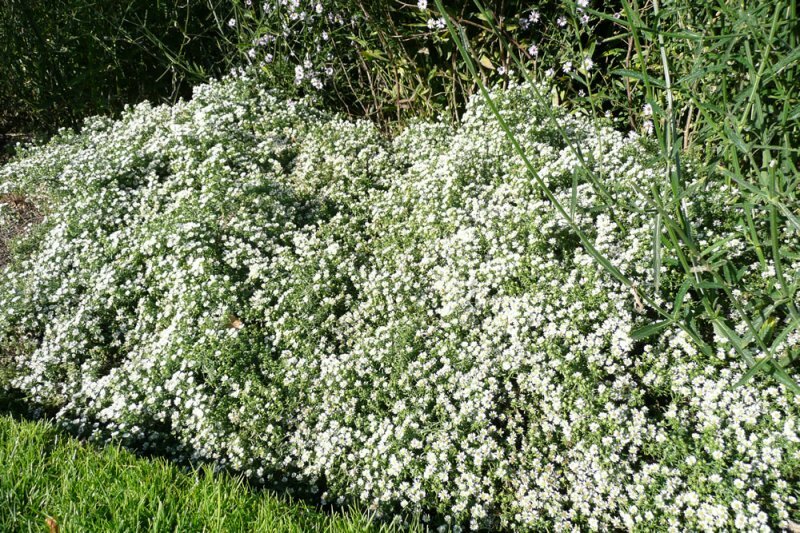 Heath aster 'Snow Flurry' and white aster 'Snow Flurry'. To 50cm height by 1m spread. Forms mounds of foliage and flowers. Happy in any soil type, except clay soil, and any pH. Prefers a moderately fertile (nutrient-rich) soil. Will tolerate exposed conditions, but won’t thrive in a north facing position. 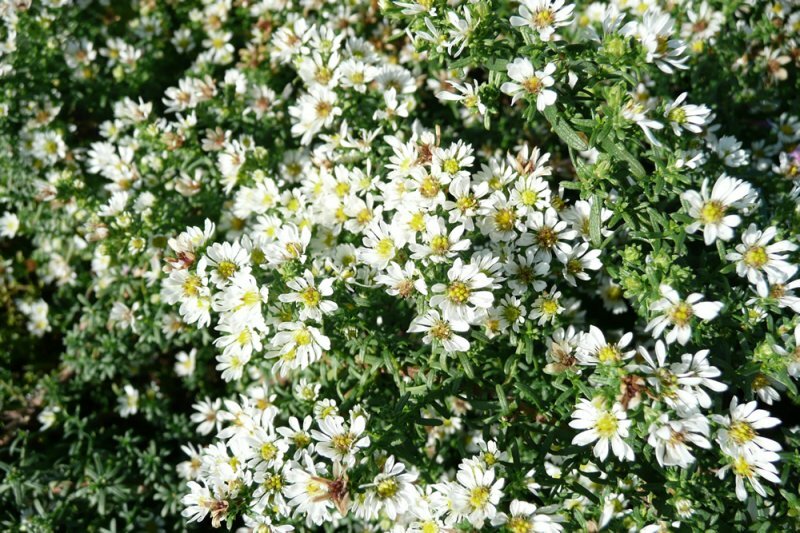 Small green leaves appear in mounds on rigid stems which, in the autumn, become awash with small, white, daisy-shaped flowers with yellow centres. A great choice for late summer/autumn colour in beds and borders, where it can provide effective ground cover or edging. A good choice for a wildlife garden as both birds and butterflies enjoy the nectar from Aster flowers. The sprays of flowers may be cut for flower arranging. To support the rigid stems, you may need to stake the plant in spring as the new growth appears, gradually raising the support as the plant grows higher (putting the support in early means that the plant will grow through it and help disguise the stakes). Benefits from being divided; if you wish to keep the plant as vigorous as possible you can do this annually. You can deadhead through the flowering season if you wish, to keep the plant looking tidy. In autumn, once the flowers have faded, cut the whole plant down to ground level. In late May you can carry out the ‘Chelsea chop’, pruning back your aster to promote a greater number of flowers, later flowering and a more compact plant. Asters should be divided regularly to keep them vigorous, and this will also provide additional plants for free. Divide the crowns with a spade or two forks back to back in spring; you can separate them into single shoots to be replanted separately. They should flower in the same year. Seeds can be collected in the autumn and sown in spring at 15°C. They should germinate in a fortnight and flower after two years’ growth. Cultivars may not come true from seed. Basal shoot cuttings can be taken in spring, or stem cuttings if there isn’t sufficient basal material. They should be rooted in a propagator or mist bench, hardened off and grown on in a cold frame. 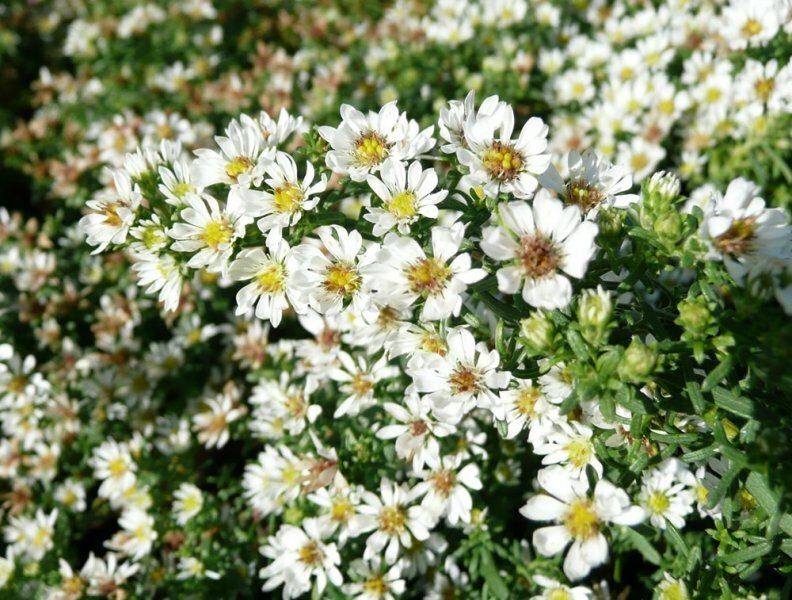 Asters are susceptible to powdery mildews and wilts. They may also be infested by strawberry mites, aphids, caterpillars, froghoppers, chrysanthemum eelworms and slugs. This Aster has been given the Award of Garden Merit by the RHS.